This article contains a compilation of the top changes in the latest Insider build for Excel for Windows desktop. To set expectations, this isn't a comprehensive list of every last little fix in the build. Instead, consider it a highlight reel of interesting new features, important fixes, and any significant issues we want you to know about. To find release notes for the other desktop apps, see Release notes for Insider builds of Office 2016 for Windows desktop. On March 28, 2018 we released Version 1803 (Build 9213.2031) to our Insider audience. There are no new features to highlight this week. Various performance and stability fixes. There are no known issues in this build. If you run into an issue, click File > Feedback and let us know. When reporting, it helps to be as specific as possible, and to include screen captures and diagnostic data, if you're comfortable with that. If you leave your email address, the Excel team may reach out to you if they have follow-up questions. To see release notes for earlier Insider builds, click in the list below. To see a history of updates for both the Insider and Monthly Channel (Targeted) levels, see Update history for Office Insider for Windows desktop. On March 21, 2018 we released Version 1803 (Build 9213.2031) to our Insider audience. On March 13, 2018 we released Version 1803 (Build 9208.2010) to our Insider audience. On March 9, 2018 we released Version 1803 (Build 9201.2008) to our Insider audience. On March 2, 2018 we released Version 1803 (Build 9127.2004) to our Insider audience. On February 26, 2018 we released Version 1803 (Build 9120.2015) to our Insider audience. On February 22, 2018 we released Version 1803 (Build 9115.2007) to our Insider audience. On February 13, 2018 we released Version 1802 (Build 9110.2002) to our Insider audience. On February 2, 2018 we released Version 1802 (Build 9026.2006) to our Insider audience. On January 27, 2018 we released Version 1802 (Build 9020.2003) to our Insider audience. On January 16, 2018 we released Version 1801 (Build 9001.2068) to our Insider audience. There are no known issues in this build. When reporting, it helps to be as specific as possible, and to include screen captures and diagnostic data, if you're comfortable with that. If you leave your email address, the Excel team may reach out to you if they have follow-up questions. On December 20, 2017, we released version 1801 (Build 8911.2016) to Insiders. 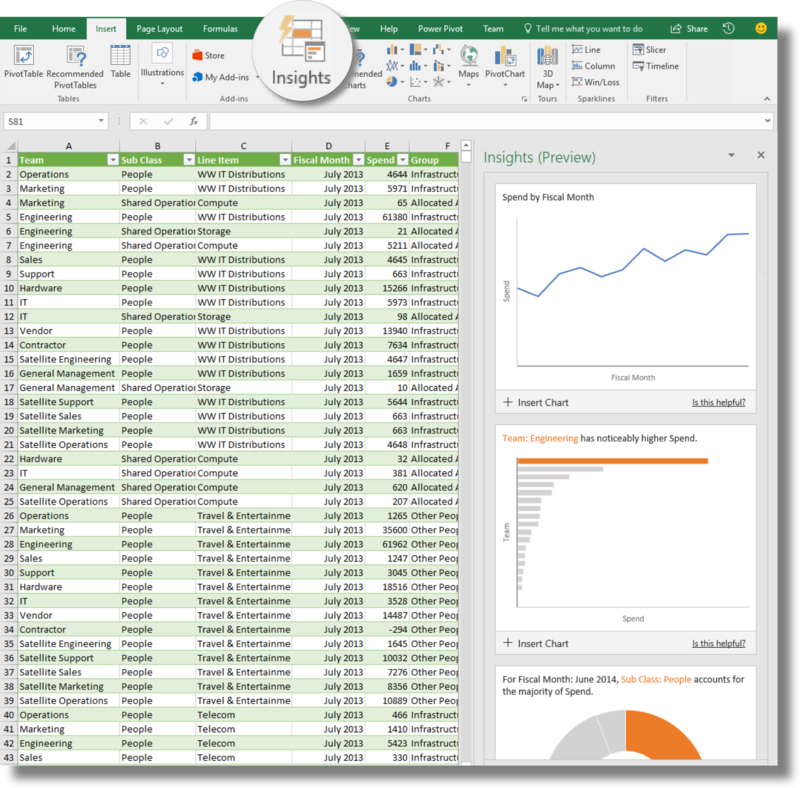 Excel Insights (Preview): Powered by machine learning, Insights helps identify trends, outliers, and other useful visualizations. Simply click a cell in a data range, and then click Insert > Insights. Availability: We're rolling out the Insights feature gradually to Office 365 subscribers enrolled in the Insider level. If you don't see the Insights button right away, don't panic! We'll be lighting it up to more of you in the coming weeks. Because this feature is powered by machine learning, it will provide increasingly advanced analysis as usage of the feature grows. Deselect a selection in Excel: By popular request, you can now deselect any cells within the selected range with the Deselect Tool. Pressing the Ctrl key, if you hover over any cell in a selected range, you can click, or click-and-drag to deselect any cells or ranges within a selection. Please try out this feature and see how it's working for you. Any issues, let us know. This build contains stabilization and performance improvements. On December 4, 2017 we released version 1711 (Build 8730.2122) to our Insider audience. Chat with co-authors while you edit: Collaborate more effectively by chatting with co-authors without leaving the app. To get started, look for the chat icon on the coauthoring gallery near the top right of the screen. In-app chat only works if you have shared the file with others and they have the document open. In addition, the file must be stored on on either SharePoint or OneDrive for Business. OneDrive Consumer, or any other storage location, is not currently supported. No known issues in this build. On December 4, 2017 we released Version 1711 (Build 8730.2117) to our Insider audience. On November 30, 2017 we released Version 1711 (Build 8730.2102) to our Insider audience. On November 20, 2017 we released Version 1712 (Build 8813.1000) to our Insider audience. However, we found a significant issue in 8813.1000 so we made the decision to release an earlier, more stable build. On September 19, 2017 we released Version 1710 (Build 8613.1000) to our Insider audience. On September 11, 2017 we released Version 1710 (Build 8530.1000) to our Insider audience. We love Insider feedback! 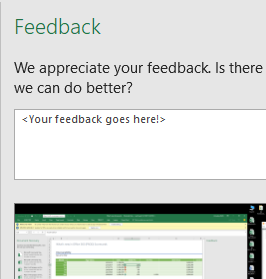 To report an issue in an Insider build, or to make a suggestion, click File > Feedback in Excel. You can also connect with us in the Office Insider community or by reaching out through Twitter. If you need to return to a previous working version, uninstall the Insider version of Office 365 and then reinstall a non-Insider version. 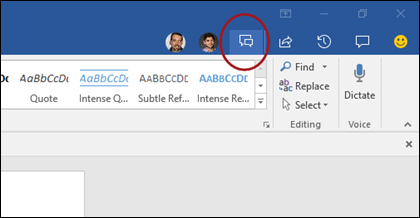 Not yet an Office Insider? Want to become one? See What is Office Insider?